At the Dubai International Auto Show 2015, McLaren unveiled the 570S, P1 and the McLaren 650S Spider Al Sahara 79 by MSO 2016. As the name suggests the later (our model here) is a custom 650S developed by McLaren Special Operations. 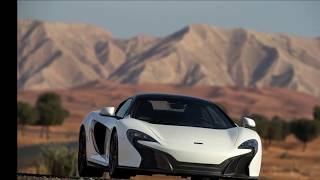 Let us have a look at the review of McLaren 650S Spider Al Sahara 79 by MSO 2016 to know in detail about the design, specification and performance figures of the release. The interior of McLaren 650S Spider Al Sahara 79 by MSO 2016 brings the White Gold color theme. In front of the electrically adjustable fully zoned seats we have contrast stitching over the Almond White Leather. Behind the flat-bottom steering wheel we have instrument cluster that is surrounded by carbon fiber insert. Apart from this the instrument cluster remains same. The center console face and the electric controls mounted over the door panels get the 24 carat gold infused white paint while the control knobs for the entertainment system, door panel rotary controls and the vents mounted on dashboard receive the dark gold. Thus rounding up the interior details of McLaren 650S Spider Al Sahara 79 by MSO 2016 I would call it super luxurious and comfortable while the sportive elegance remains constant. Just like the interior the exterior of McLaren 650S Spider Al Sahara 79 by MSO 2016 gets the pearlescent White Gold with the essence of 24 carat gold particles. The design and the texture is said to be inculcated keeping in mind the region it has been made for as the texture shimmers in the desert sun. Starting with the front fascia the model get intakes that supply air to the engine and a splitter made from carbon fiber that adds to aerodynamic performance. Along the sides you will notice the MSO-branded blades and the five-spoke forged alloy wheels dipped in gloss black. At the rear it has a beefy appearance while the diffuser adds commendably to the scenario with those mesh insert inclusion that has been made to the exhaust port. 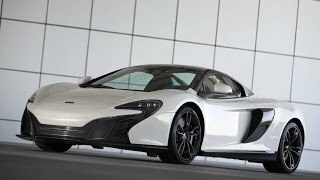 Thus rounding up the exterior details of McLaren 650S Spider Al Sahara 79 by MSO 2016 I’ll call it a gem of design and architecture that’s offering you ample amount of headspace with its retractable hardtop. Beneath the hood of McLaren 650S Spider Al Sahara 79 by MSO 2016 is a 3.8 liter mid-mounted twin-turbo V8 that cranks total output of 640 hp and peak torque of 678 nm mating to seven-speed dual-clutch transmission. With this power the 186 mph speed can be attained in 26.5 seconds while the 0-62 mph sprint can be knocked in just 3.0 seconds.